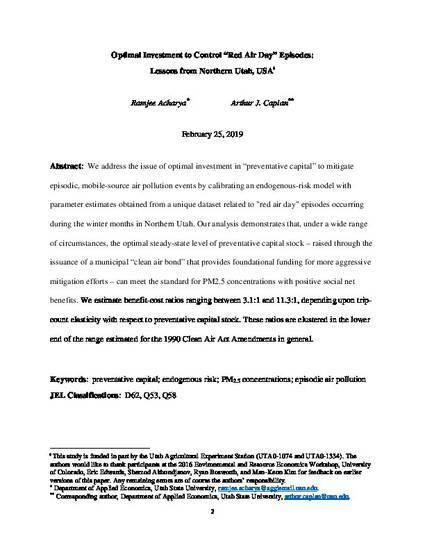 We address the issue of optimal investment in “preventative capital” to mitigate episodic, mobile-source air pollution events by calibrating an endogenous-risk model with parameter estimates obtained from a unique dataset related to "red air day" episodes occurring during the winter months in Northern Utah. Our analysis demonstrates that, under a wide range of circumstances, the optimal steady-state level of preventative capital stock – raised through the issuance of a municipal “clean air bond” that provides foundational funding for more aggressive mitigation efforts – can meet the standard for PM2.5 concentrations with positive social net benefits. We estimate benefit-cost ratios ranging between 3.1:1 and 11.3:1, depending upon trip-count elasticity with respect to preventative capital stock. These ratios are clustered in the lower end of the range estimated for the 1990 Clean Air Act Amendments in general.